. Kaen of Motria . Personality: Very talkative, curious, a little cocky, intelligent, mad scientist. Interests: Science, experiments, interesting conversations. Dislikes: Ignorance, being treated like a hatchling, talking about his past. Fears: Being captured by his uncle. Scales: Pale cool brown. His scales are smooth and flexible like rubber. Eyes: Big and curious. His irises are purple like lavender. 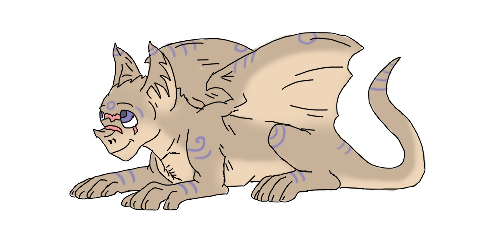 Appearance: Kaen is a very small and petite Dragon. His big, cute head and his big hands and feet make him look more friendly and innocent than he actually is. Tribe: None, used to be a part of The Motria Cult. Inheritance: The entire Motria Temple and it's prisoners. Family: Kíli of Motria (Father), Maya Sun (Mother), Gozok of Motria (Uncle). Mate: "I like chemical reactions, but not THAT kind of reactions!" Strengths: Very intelligent, agile, fast. Weaknesses: Weak muscles, brittle bones. Combat Style: Trying to avoid battle in the first place. If there's no other option, he will flee. Suddenly, the foul liquid began the fizz. Large indigo bubbles popped from the wooden bowl. 'Of course... of course!!' The small Dragon began the grin. He began to write a calculation down zealously, while his grin extended into a mad laugh. 'Hahaha!! Of course! Who'd thought that Drake-butter would fume when it's mixed with dehydrated Nirnroot?!' He snorted contended. 'Probably nobody. All those Scalebutts around here are to ignorant to distinguish steam from smoke..' Kaen inhaled the purple fume and smiled. This... this was perfect. This was, like, the biggest breakthrough since his escape! Re: . Kaen of Motria . Hello Kaen! Welcome to Dragons Roleplaying Forum! It's nice to have you! Now, first of all, I'd like to let you know that there are seven distinct tribes on this site, the EarthWings, FireWings, NightWings, IceWings, SeaWings, SkyWings, and LightWings. For more information on the tribes, you can search here. This first link will provide you with details about making your character app, as well as descriptions of the dragons from each tribe, and what inheritance is. This will not only give you an overview of the tribes, but also a brief history of the site and its lore. As for your personality, we ask that you go a bit more in depth with your descriptions, and have at least 5 full sentences. After you've updated your app, go ahead and reply letting us know! If you have any questions, you can either visit the chat to get them clarified, or you can pm a mod or admin.